A love story for Christmas—now a Hallmark Channel original movie—from the #1 bestselling author of The Christmas Box and The Walk. Elise Dutton dreads the arrival of another holiday season. Three years earlier, her husband cheated on her with her best friend, resulting in a bitter divorce that left her alone, broken, and distrustful. Then, one November day, a stranger approaches Elise in the mall food court. Though she recognizes the man from her building, Elise has never formally met him. Tired of spending the holidays alone, the man offers her a proposition. For the next eight weeks—until the evening of December 24—he suggests that they pretend to be a couple. 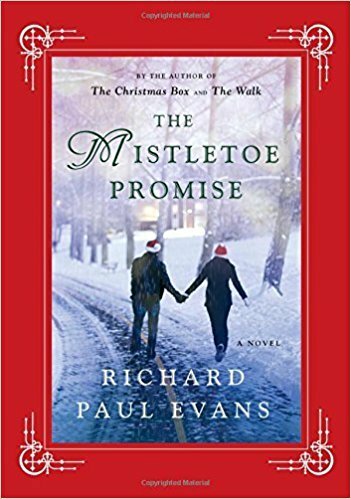 The Mistletoe Promise is the first book by Richard Paul Evans that I have read. I have a friend that enjoys his books, so I decided to give this Christmas one a try. I am so glad I did. Yes, it reads kind of like a Hallmark movie. It has actually been made into one, but it is a sweet Christmas romance story. The characters have some depth to their lives, and it is not a picture perfect romance, although I could totally see how it was going to end. If you love Hallmark Christmas movies, I think you will enjoy this book.